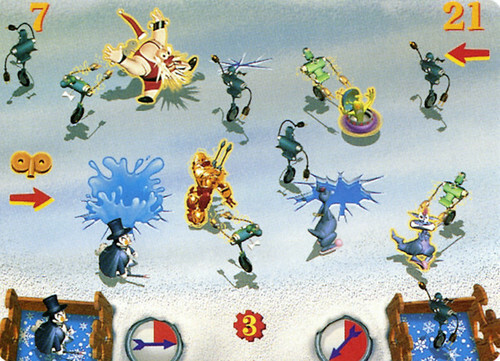 In Gearheads, two players release wind-up toys across a playfield, trying to get as many toys as possible across the far side. The hitch is that you don't control toys after they are released, and any toy can be used to score points for other players. Each toy has its own behavior: a bulldozer pushes toys; a chattering skull scares toys and reverses their behavior; and Clucketta the chicken lays eggs that hatch and produce chicks. Every toy can pair with other toys in unexpected ways and the result is a like a quick-play version of a real-time strategy game. Frank Lantz and I led the game design of Gearheads - so this title represents the beginning of our collaborations which continue today at the NYU Game Center. Easy to learn and difficult to master, Gearheads was my first commercial videogame and will always have place in my heart.